In our previous post, we talked about Emergency Fund and its importance. In this post, I will explain few Best Short Term Investment Plans with High Returns for short term goals. Any investment that is to be liquidated in less than 3 years is called short term investment. The main goal of this investment is to protect capital with low-risk investments. Short Term Investment Plans are aimed at providing the required amount of money for the goals that going to occur in the near future. Children Marriage – Where he/she is 21 years old and you feel that the goal should be achieved in next 3 years. Children Education – Where he/she is 15 years old and after 3 years he/she will need cash for Graduation. Even though primary education could cost a decent amount of money, Graduation, like Medicine cost Crores of Rupees now and in the future. Buying a Car in Next 3 Years. Gifting Diamond Ring to wife on the wedding day. In this kinds of situation, you need to invest in Best Short Term Investment Plans with good returns. Let’s look at some of the Best Short Term Investment Options in India. I will list all the options available to park your funds for short period of time. I will give my views on which option you need to choose for short-term goals. 1. Savings Bank Account: – It provides better liquidity and provides 4 to 6% Returns.It is ideal for emergency fund but not short term goals. I do not recommend you to invest in this option. You can park funds only when the goal very near, say, a few days to 1 month. Remember that, short term goals are, not emergency goals. You can have some time to liquidate your investments. 2. Gold: – If you are investing for your child marriage, you will definitely need some gold as the Indians usually buy gold for this occasion. Why not invest in gold before hand when it is needed for the goal. Gold ETFs is the best way of investing in gold instead of physical form. In other cases, you should not choose gold as an investment option for your short term goals. 3. Bank Fixed Deposits: – Bank fixed deposits offer 7-8% interest rate. Even though this is very less, your corpus will be in safe hands and you get guaranteed return. You can invest some portion of your corpus amount in Bank Fixed Deposits. 4. Liquid Mutual Funds: – The mutual funds that invest in short-term government bonds and securities. Liquid mutual funds invest in securities that mature in less than or equal to 91 days. You can enter and exit at any given time. So, you don’t lose anything on exit. Returns on Liquid Mutual Fund Investments are tax effective. One can expect around 6 – 7% return on liquid fund investment. Like any Mutual Fund, there are two options for the investor. One is dividend option and another is the growth option. Investors who are in lower tax bracket can opt for the growth option, while investors in the highest tax bracket can choose either option. 5. 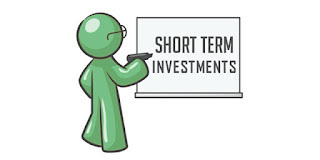 Short-Term Debt Funds: – Short Term Debt funds invest in securities that mature in 1-3 years. Taxation is the same as any other debt funds. You can keep money in these funds for few months. They offer 8-9% Interest Rate. These funds invest in slightly longer term debt instruments with a maturity of more than 91 days and less than 1.5 years. 6. Corporate Bond Funds: – Instead of taking the mutual fund route, you can directly invest in corporate bonds which offer a high rate of interest rate. A corporate bond is usually issued by a corporation in order to raise funds for the ongoing operations, new projects, Mergers & Acquisitions, or to expand the business. You need to understand the company and its business and its past record and its rating history to determine whether to invest or ignore. Please remember that, if you really know how to select the bond of a company, then only attempt this route. Otherwise please ignore it. Don’t Gamble. Don’t fall prey to the high rate of interest offered by bad companies. 7. Recurring Deposit (RD): – If you are not in a position to invest lump sum amount, you can choose monthly investment plans like Bank or Postal RDs. It is a very secured investment with guaranteed returns. Banks provide flexibility with regard to the period of investment while post office offers only 5 year period. Banks offer premature closure of RD and you can also loan facility on RD. So it is best to choose Bank RD over Postal RD. Interest received on RD is taxable. 8. Fixed Maturity Plans: – This Short Term Investment Plan has a minimum lock-in period of three years. These are the closed ended debt funds. So, you should not invest your emergency funds in this plan. You can expect better returns than Bank Fixed Deposits. Even though they provide guaranteed returns better than Bank FD, you should invest only when you need not funds for the next 3 years. These are the Best Short Term Investment Plans & Options in India. Now, I express my views on where to invest money for your short-term goals here-below. My Views: – The objective of Short Term Investment Plans is that the capital should be 1) Risk-Free. 2) Decent Returns. Here, Liquidity is less concerned because any of these assets can be liquidated within 2 days. The goals mentioned above do not need funds immediately. You have the adequate amount of time to liquidate. There is no medical emergency involved. So, focus on Risk-Free Returns and Decent Returns (I could say, inflation-beating returns). Saving Bank Accounts: Park funds in this account for few days. Not even a month. Gold: Invest some portion, say, 15% in gold ETFs to diversify your portfolio. Invest in gold only when the investment horizon is minimum 3 years. Bank Fixed Deposits: Invest 30% of your corpus in Bank FDs. This is also for the sake of portfolio diversification. You can choose this option for any amount of time. Liquid Mutual Funds: Keep the money for a few days or weeks in liquid funds. Use this option as an alternative to saving bank account. Short-Term Debt Funds: Invest 30% of your corpus in Short-term Debt Funds. Keep the money for a few months in a conservative short-term debt fund which has a track record of not doing anything complicated. Don’t go for aggressive funds. You can invest some corpus in Bank FDs and Some portion in Short-Term Debt Funds to diversify the portfolio. Corporate Bond Funds: Invest only when you know very well about the corporate world and its INs& OUTs. Don’t fall pray for high-interest rates of some bad companies. If you know well about the company that issued a bond, you can choose to invest some portion of your corpus fund. Recurring Deposits: It is the best option when you want to invest monthly and build a corpus fund for the future goals. Choose Bank FDs over Postal RDs. Fixed Maturity Plans: Choose this option only when you don’t need funds for the next 3 years. You can invest some corpus after allocating funds to Bank FDs and Short-Term Debt Funds to diversify the portfolio. I Advice you to invest in Bank FDs, Short-Term Debt funds, and Fixed Maturity Plans when the goal is few months distant. When the goal is just a few weeks away, liquidate the investments in Short-Term Debt funds, and Fixed Maturity Plans and park funds in Savings account or liquid mutual funds. You can continue Bank FDs. When the goal is just under 5 days, liquidate all funds including Bank FDs and park all the funds in the savings account. You need to consider Tax factor in the case of all the investment options available. Don’t overestimate the returns. Only evaluate tax-adjusted returns. Diversify your portfolio, don’t invest all money in one fund. You may come across Short Term Investment Plans in equity-based mutual funds and someone may advise you to invest in stocks for better returns. But one should not invest in stocks or related products when the investment horizon is less than 5 years. I have seen some top websites have listed these options for short term investment. But I strongly recommend you to avoid the equity based investment plans. Please remember, Equity investments are suitable for a time horizon of at least 5 years. So, these are the Best Short Term Investment Plans & Options with High Returns in India. Choose anyone according to their tax benefits and interest earned and its risk.